On Thursday, Trevon Johnson made his second visit of the week to the Secretary of State office to renew his identification card. That’s because his trip Wednesday was fruitless. He didn’t have time to wait until his number was called, so he left. Johnson likes doing business at the bustling midtown Detroit neighborhood location, but he has a suggestion. “I feel like they need their own parking lot, so people don’t have to pay or get a parking ticket,” he told the Advance. Parking lots in the area cost between $7 and $10. And a parking ticket is $45 in a city where one-third of adults earn less than $29,000 annually. 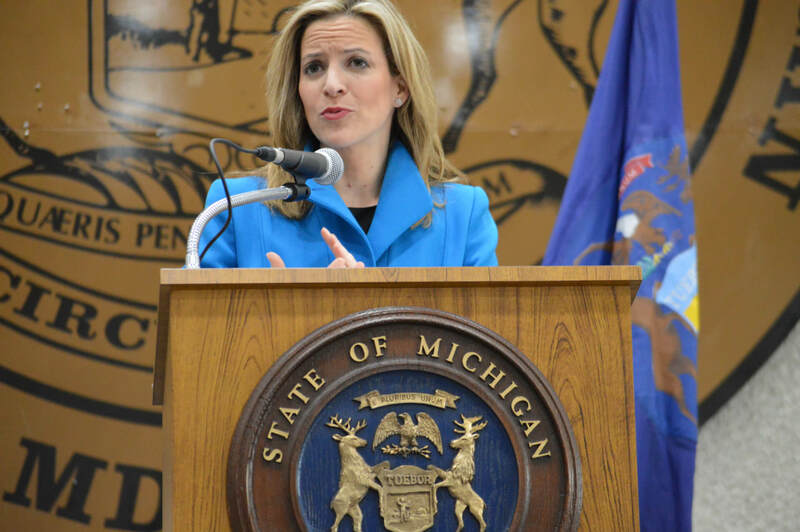 Secretary of State Jocelyn Benson gave an update on Thursday in Detroit on what was her 100th day in office. Benson, the first Democrat to hold the office since Richard Austin in 1995, has toured 131 branch offices across Michigan as part of a campaign pledge. The Advance in January reported that Benson was considering partnering with community organizations in cities like Detroit to provide more customer-friendly visits with convenient parking. She said at a press conference Thursday that it remains an option, but technology problems that have occurred in recent months take precedence. As the Advance reported, the MI-TIME system, which allows customers to virtually take their place in line ahead of a branch visit, went haywire in February. The system is offline, resulting in long wait times and frustrated customers. During her 2018 campaign, Benson made a pledge that Michiganders would be able to finish SOS branch visits in 30 minutes or less. She said on Thursday that she has benefited from conversations and visits at each branch office, but warned it could take years to fully implement changes. In one effort to cut down on wait times, she said she has hired two Arabic-speaking staffers in her Dearborn office to address a language barrier there. Benson also told the Advance on Thursday that she’s lobbying the Legislature to fund three mobile units that would provide services throughout the state. However, Michigan GOP Chair Laura Cox ripped Benson over Twitter following the press conference, declaring that “campaign double talk is cheap. “In 2022, Michigan Voters will remember when Jocelyn Benson failed to keep her promises,” Cox wrote. Benson also plans to lead an effort in May, along with other secretaries of state across the country. She wants to hold an event celebrating the historic Selma to Montgomery Civil Rights march in Alabama. The 1965 march involved Dr. Martin Luther King Jr. and led to the signing of the seminal Voting Rights Act. Viola Liuzzo, a Detroit activist who traveled south to participate in the march, was murdered there. She was born on this day in 1925. “Her legacy is never far from my heart,” Benson said.